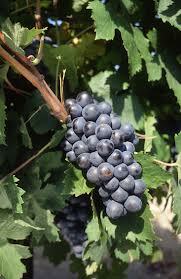 Cinsault, (or Cinsaut) is most often used as a blending grape with other types. France has more Cinsault planted (50,000 hectares) than Cabernet Sauvignon and there is as much Cinsault acreage planted in its former backdoor wine colony of Algeria. The grape was originally known as “Hermitage” in South Africa (confusing, since the famed French Hermitage is entirely Syrah). When a South African professor crossed cinsault with Pinot Noir, he therefore named it Pinotage (now the country’s signature red wine). Cinsault was the most widely planted red variety in South Africa until it was overtaken by cabernet sauvignon during the last decade of the 20th Century. First imported to California in the 1860s, it was known as Black Malvoise and, blended with Zinfandel, labeled “Claret.” Somehow surviving past Prohibition, it was made as wine into the 1960s, sometimes labeled Malvasia Nero. Acreage peaked in 1971 to a total of 810 statewide, but current surveys count less than 150. Wine made from cinsault grapes can be very aromatic with a vaporous perfume that assails the nostrils and supple texture that soothes the palate. Fairly low in tannin, it is often made into rosé by itself or blended, to brighten the fruit and tone down the harsher edges of carignan, in particular. Although officially sanctioned in Châteauneuf du Pape, it is used by only a few producers in their blends. Nine California wineries currently produce Cinsault including Alapay Cellars in Avila Beach, Pelican Ranch in Capitola and Black Sheep in Murphys.